James "Ted" Ryan received his Bachelor's degree from the University of Connecticut. He studied law, graduating from Cornell Law School. Following law school, he entered the Air Force as a JAG and had extensive trial and governmnent contracts experience at a Strategic Air Command base stateside and in the Republic of China. In 1968, he returned to civilian life and the general practice of law, settling in Woodbury. 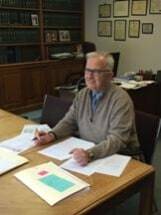 He has practiced in Woodbury and the surrounding towns ever since, and established his own law office in 1982. The legal needs of the community has led Ted to focus particularly on real estate law, estate planning, and probate, although he deals with many other areas of law. He does no criminal or motor vehicle work or domestic relations. His extensive experience provides practical solutions to transactional and personal problems and situations. Ted is a veteran (USAF Captain, JAG), a fifty-year Master Mason, a forty year Rotarian, and a forty-year member of MENSA.